It’s hard to tell which one is more famous, Clem Johnson the motorcycle drag racer, or his motorcycle, “The Barn Job.” Frankly, you can’t talk about one without disusing the other. Any way you look at it, they are both legends in not only motorcycle drag racing, but in the sport of motorcycling as a whole. Sadly we report, that on December 2, 2013, Clem passed away at age 82 of natural causes. While he has left this event we call life, what he did and what he created will live on forever. 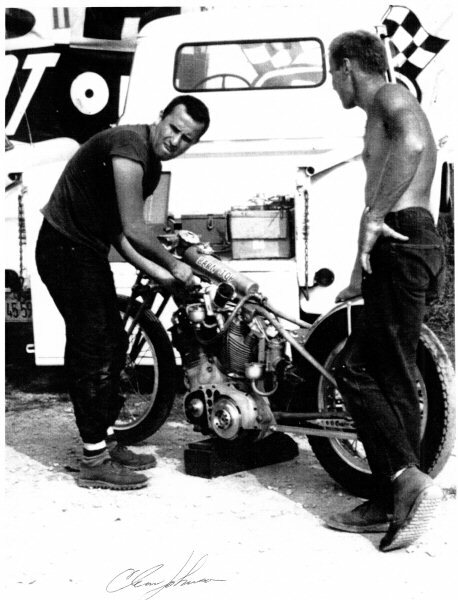 Clem Johnson with his famous Barn Job, Vincent drag bike in September of 1961, getting ready to make a pass at US 30 Drag Strip, Hobart, Indiana. To the left of Clem is the double engine Triumph of Ben Krammethbauer. Photo courtesy of Jim Leineweber photo archive. 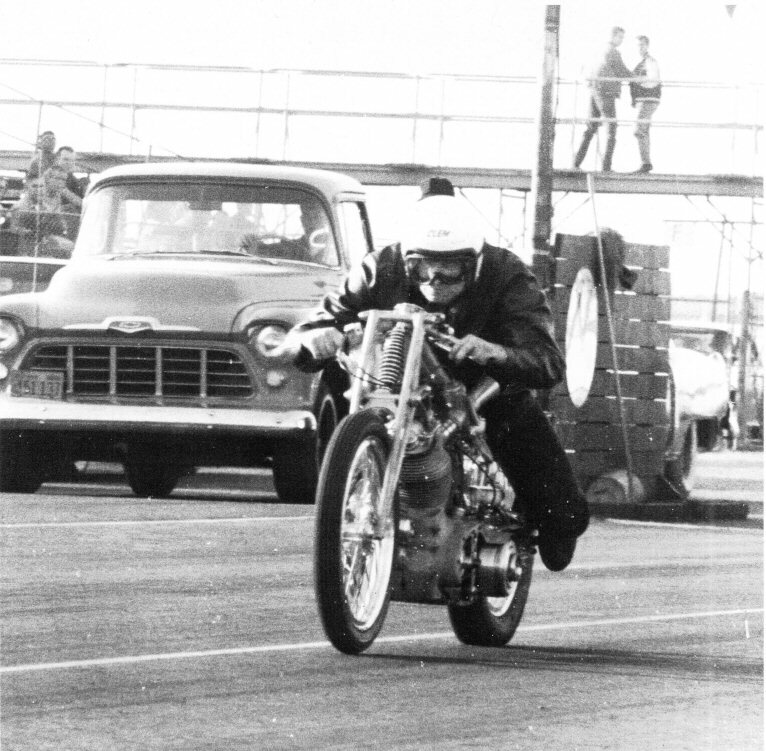 Clem’s life story in motorcycle drag racing is truly the stuff legends in racing are made of. He started in the sport when the sport itself was just getting going in the mid 1950’s. There were no sixty-foot clocks, no LED starting tree lights, no mail-order go fast parts for drag bikes. When Clem entered motorcycle drag racing, you made it yourself: this was the era of innovation. Clem was born June 20, 1931, in Buffalo, New York. As a young man growing up, Clem was into things mechanical and started off with “Mini-bikes” and such until his teen years. He got his first motorcycle at age 15 in 1946. That first ride was a 250cc BSA. He also came to own several Velocette bikes, a Norton and eventually had a 1930 Harley. But his heart was with the British bikes. He mentioned once in a magazine interview conducted by none other than Big Daddy Ed Roth, in the October issue, of Choppers magazine, “I was an odd ball to be sure. Because all the American riders thought Harleys were good machines, but inch for inch, you can’t beat the English bikes.” Clem liked em all but his love was for British Iron. Clem Johnson (L) and Jim Leineweber (R) in 1961, discuss track conditions on another hot day in the pits. Photo courtesy of Jim Leineweber photo archive. Clem bought one of the first Vincent motorcycles ever to enter the U.S. in 1952, just before he entered the United States Army that year. After he served his country, not long after he got out in 1954, he sold his first one and bought a second Vincent. This time he purchased a 1949 Rapide model. Now keep in mind this bike stock had a 55.5 inch wheel base, and a 998cc motor that was rated for 45hp at 5200 rpm and had a weight close to 460 pounds. Yes folks, that really did happen, the story of Rollie Free. Previous runs with his leathers and his helmet on were only (only) at 147 mph and Rollie insisted he and that bike break 150 miles-per-hour. So the man did what he had to do and according to the Cycle World magazine story, Clem was suitably impressed by reading about this. So much so he was inspired to go racing. Now as to whether or not the Rollie Free story did or didn’t inspire Clem in 1954 when he got out of the Army, what is known is in 1955, when Clem was living in southern California, he discovered drag racing when and where the sport was born. Clem was 23 at the time and he was a hot rodder from the word go. He learned basic machine shop procedures from his teen years in Buffalo and after he got out of the service, Clem was a tool and die maker at Reflex Labs in southern California. Clem Johnson driving the Barn Job off the line at Long Beach California. Note the lack of gloves on his hands and no front brake system on the bike. Photo courtesy of Jim Leineweber photo archive. Clem began to frequent Lions Drag Strip in 1955 when the track first opened, run by local hot rodder Mickey Thompson, and was affiliated with the local Lions Club. Clem was also soon to frequent Orange County International Raceway or OCIR as veterans like to refer to it. These race tracks that were the cradle of un-civilization for drag racers was right in Clem’s back yard. It must be made clear here that Clem’s version of drag racing was not necessarily the kind of drag racing most racers think of in today’s terms of drag speak. Clem was not about national championships, national records or coast to coast barn storming. He was about Man Vs Machine. For him it was old school drag racing, the challenge of how fast could he make it go and what kind of performance could he get out of the bike. You won’t find Clem Johnson’s name listed as the top winner in this series or that sanction, nor will you find him listed in conjunction with any National Records. Clem was a racer’s – racer, a man of purpose with great focus out to see what he could make his machine do. 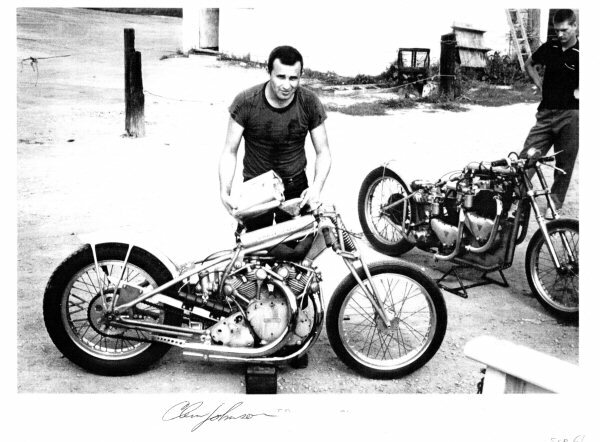 It is generally accepted that Clem is said to be the first motorcycle drag racer over 130, 140, 150 and even 160 mph. When you stop to consider Clem Johnson started out with a 45hp, 1949 motorcycle you begin to understand what Clem accomplished in his time. Clem took an antique Vincent motorcycle that could barely run 13 second elapsed times at close to 100mph and over the years he managed to squeeze an 8.40 at 187 mph out of it with a small tire, two cylinders and a homemade aluminum chassis. This photo taken in the early 1970’s shows Clem Johnson doing the burn out, and Jim Leineweber in his leathers ready to drive the bike and make the pass. That’s Ralph Owen to the right of Clem helping Jim hold the bike back during the burn-out. In the evolution of the bike, Clem has installed the Ceriani front end Jim gave him, but still no front brake at this point. This photo was once used on bubble-gum trading cards! Photo courtesy of Jim Leineweber photo archive. The stock factory 1949 Rapide model Clem started out with had a curb weight of close to 460 pounds. By the time Clem was done with it, he had the bike down to around 260 pounds depending on the combination in the bike on any given day. You see he NEVER stopped experimenting with his combination. Clem started out like all street bike racers do, first off comes the seat, remove the headlight, change the handle bars, and start modifying the motor. Clem made everything you ever see in photos of the Barn Job himself at home. The only thing Clem didn’t do himself was the Heli Arc welding. He considered that a craft unto itself and for that he sought help. Everything else he machined up. One of the first major changes Clem went for was a second front head for the bike that allowed for better air flow for the carbs. Then the Amal carburetors were scrapped for larger Dell’Orto carbs. In the 1950’s Clem was using almost exclusively gasoline, but everyone was tinkering with blends and it would be foolish to think the man who was arguably the ultimate tinkerer would not mass with the fuel mixture. After all, he was not running in a points series, he was out to see how fast he could make it go. In 1987, at Palmdale, California, the made it’s last pass. Here’s the bike in it’s final form after 3 decades of evolution. Yes, that’s a supercharger hiding under the drivers seat and indeed the bike has front brakes. Running low 8’s at 187 mph it needed them! Photo courtesy of Jim Leineweber photo archive. When a racer wants to go really fast, it’s only a matter of time before they “Tip the can” as it was known back in the day, back when CH3NO2 was sold in one gallon tin cans, kind a like paint thinner, only more exciting. Clem ran nitromethane for fuel for the first time in May of 1962. Prior to this he had whittled away at the Barn Job’s elapsed times with a best of 9.80 at 149mph before he made the switch to nitro. Once he tipped the can, he was up to 160 mph and he started working on mechanical fuel injection to go with the nitro by the mid 1960’s. As with any long term metamorphosis there were a lot of growing pains. Considering he started out with a bike that only made close to 45 Hp, his achievements were amazing. Clem had to make his own fly wheels, valves, pistons, he even took eight months to make a cam shaft grinding machine to make his own cam shafts with. So please keep in mind, his motorcycle did not run every year. Some times there were many months indeed between runs. And the faster he made the bike go, well, here we go again. It would be incorrect to say “when he was done with it” about the Barn Job because Clem never stopped loving, never stopped tinkering with his Vincent. But ultimately, over time, there were no more Vincent parts left on Clem’s Rapide. Only the side covers of the motor and the cam gears remained as true Vincent components by the 1980’s. Clem added a Harley clutch, various magnetos, front brakes, mechanical fuel injection, even an 80 CID Magnuson supercharger, starting in 1980, graced the famous Barn Job. Clem was a man on a mission. In 1969 after having been the crew chief, pit crew, sponsor, builder and driver for 15 years, Clem gave up the driving duties to a man he looked up to and believed in as a fellow racer: Jim Leineweber. Jim had been racing and making Harleys go fast since 1956, so they were well aware of each other as racers in the southern California area. In fact for a while, Joe Smith raced for and with Clem in the late 50’s till they decided to go separate ways. But in 1969, Jim took over the driving duties and stayed in the hot seat till they made their last pass in 1987. Clem started tinkering with the Barn Job in 1954 and he continued to do so for at least 33 years. Clem Johnson did all he could to get every last ounce of performance he could out of that bike. 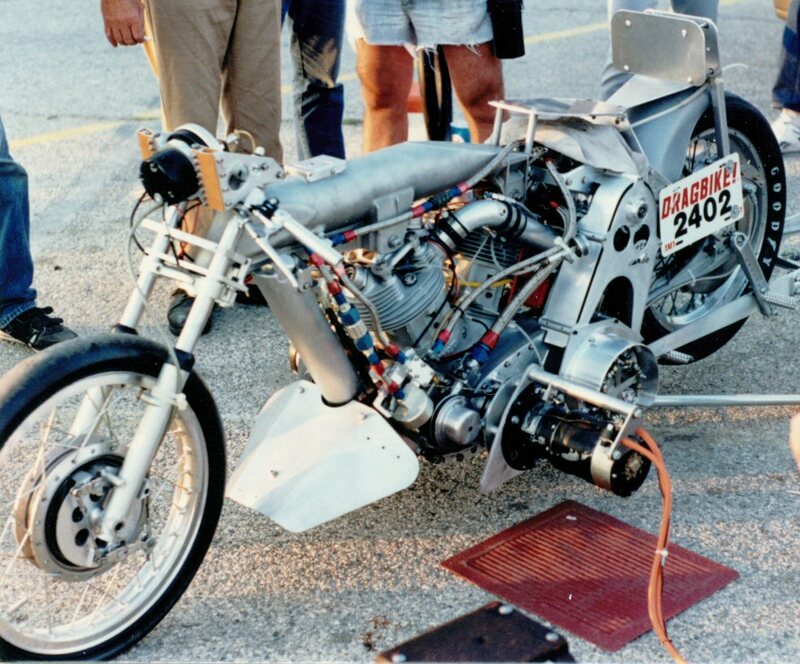 And even in 1987 when it’s likely the bike made it’s last run it was still under development. Clem had just made up a new back-half for the bike as was finally, after three decades, ready to try out a “car tire” type rear wheel assembly. But time had taken it’s toll, and in 1987 at age 56, the bike wasn’t slowing down, but Clem was. 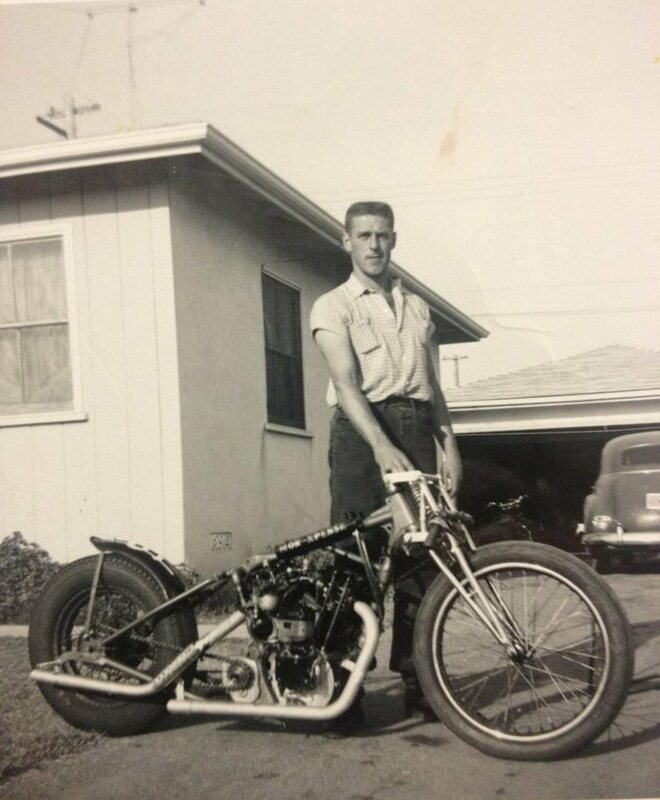 Ralph Owen, in the 1960’s was a motorcycle drag racer like many of his friends. In 1964 he sold this bike with the help of Marion Owens, of Oklahoma, and began working as pit crew for his buddy Clem Johnson. They remained the best of friends for life. Photo courtesy of the Owen family archive. So Clem took a brake for a bit and that made life bit easier for him and for his racing buddies Jim Leineweber and Ralph Owen. 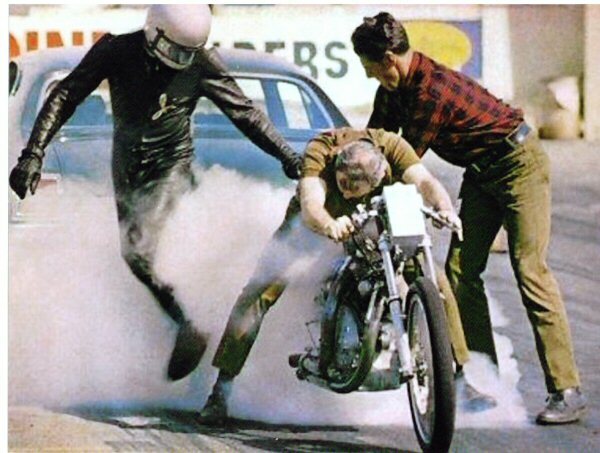 Ralph joined Clem’s racing efforts in 1964 after Ralph had quite enough of racing his Harley Davidson drag bike. Ralph sold his gear with the help of Marion Owens of Oklahoma, and Ralph transitioned from driver to pit crew. From 1964 till he stopped breathing, Ralph and Clem were racing buddies, and that was that. When Ralph’s health began to falter around 1990, two very important things happened that shaped the future of Clem Johnson and his racing efforts. One was without Ralph his racing buddy, Clem just didn’t have the ambition to race. As a reciprocal, Ralph had thoughts on this as well. So instinct took over for the two racers and they both looked out for one another. Ralph took his son Glen aside one day and said “Look, if anything happens to me, and I’m not around one day, you look after Clem. He’s gonna need help one day and I might not be here so you give me your word on this ok son?” Without hesitation Glen assured his dad, Clem would always be looked after. That’s when it all changed for this team. As for the bike, the world’s quickest and fastest Vincent drag bike, the Barn Job stayed with it’s maker for more than another decade. In time a collector, a man who truly loved drag bikes, contacted Clem while doing a book on the history of motorcycle drag racing: Mr. John Stein. John knew who Clem was and admired him and his Vincent greatly. They eventually struck a deal so that the Barn Job would get a proper home now that it’s racing days were over. John had Clem freshen up the bike and remove the supercharger so it’s original fuel injected magnificence could well be visualized by all who would come to know Clem’s creation. The bike is as much art as it is the evil, wicked, mean and nasty fuel bike it evolved into. This gave Clem some time to tinker in his later years, at age 70, once again in his work shop, with his drag bike, the Barn Job, attending his never ending project. The bike now resides with John Stein as part of his growing collection of race bikes. During the year 2013, Clem suffered a series of strokes that robbed him of his health. True to the Owen family code, on June 30th, Glen Owen accompanied by his wife and two children, moved into Clem’s home to care for him. Round the clock, when Clem was not in the hospital from his debilitating decline, there was an Owen family member at Clem’s bedside. On December 2nd, 2013, Clem Johnson passed on from this mortal life. Much to his credit, the Barn Job lives on. I’m sure it came as no small measure of comfort to Clem, knowing his life’s work will live on forever. A very nice tribute, well done. I remember reading about Clem and the Barn Job in Hot Rod Magazine many years ago and actually saw it run several times at Lions. To me Clem was to drag racing what Burt Munro was to land speed racing. They both took older bikes and did spectacular things with them. Back in 1966,Clem brought the “Barn Job” to the Woodburn Dragstrip here in Oregon. He put on one hell of a show, smoking the rear tire for at least half track and feathering the throttle for traction. If memory serves he was in the mid-9’s at 159 mph. Thank you for history lesson. Seen Clem at Lions & Fremont. Always one of my favorite drag bikes. Totally awesome !!! I always admired Clem and his Barn Job. I loved to watch when it was him matched up aginst Joe Smith or Boris Murrey for the money. That was some great racing. I mostly ran at the beach. Mostly ran @ the beach. I met Clem at Lyons in the 60s, his Vincent was amazing. I ran a 650 Triumph, was 16 years old and pieced it together, got some Nitro and ran 12.59, 107 MPH before I blew the engine. Those were the days. RIP Clem. Reading this and seeing this article is just a magnificent piece of workmanship and worthiness as friends could ever be till the clock stops and daisies start to grow. For my grandpa Ralph and Clem it was a friendship bond for life. As mentioned in this article Clem was not one to take a picture. While standing outside waiting to take a family picture, in front of our grandparent’s house in Carson, California. I laughed out loud as a kid at this picture, while recalling, Clem trying to inch away, from zero to 150 mph to walk away from once again another picture. But not so fast grandma Mary said “Clem you will take this picture” Clem walking back with his head down says “alright I guess,” and lets out this distinctive laugh, which I can hear him to this day. Seeing and believing are two remarkable and amazing aspects of life in general to truly see. An up-close friendship these two both shared is truly a “Notebook” memory these two gentlemen shared. I like echo out high above Mount Everest to Mount Rushmore to thank my Tia Silvia and Tio Glenn for taking care of Clem Johnson until the time clock ticked no more, to this wonderful kindhearted gentleman expired at 82 years old. I like to thank Clem, and my grandpa Ralph and many others of importance for your pioneering time in the motorcycle world. You are truly the backbone of today’s generation of where rubber meets the road! Clem Johnson you will be remembered across the globe for your engineering aspects, and machinist capabilities. You have inspired many of motorcycle enthusiasts to take up the need for speed and to break records still to come. I worked with Clem in Covina at Pall Corp and I drag raced VWs in late 67-72. We used to go to the pistol range once a week indoors. What fun we had working and talking over engine design, guns etc. I would like talking with you on the phone. Were you the rider he spoke of? These types of stories can’t be made up. I grew up in the 50’s and 60s, joe hemmis was a 5x national hill climbe, a neighbor, a lifetime family friend, and helped run their triumph shop on the side. His full time job was a railroader. Those were the golden age of biking. They made a movie about these guys; On Any Sunday. God bless these guys. Lifetime friendships that couldn’t be broken. What a great tribute to a real pioneer. This is so inspiring for those of us who enjoy creating our own path. More than anything however Clem’s story, written by and contributed to, by his friends and those whose paths crossed with Clem is a lesson in respect, loyalty and true friendship. Thank you to Clem and all of the men mentioned in this story for giving the rest of us something to aspire to that has real value in our lives if we are fortunate enough to realize the importance of it. My brother, Bob Baker, bought the Barn Job from Clam. He then raced it for a while, mostly at Pomona and Colton. Other brother, Ronny, raced Triumphs for Don McEvoy. I was Pit Crew. Lol. Clem is an inspiration to us all. And by us, I mean all of us “barn jobs” out there! My cousins and I nursed a sportster to 3 national records in the idba in the late 1970’s and early 80’s and those were some of my fondest memories. I am 54 now and we went to Suzuki in later years, but I will never forget the days and nights with all of us smashed into the pickup cab with that ole lay down gas bike in the bed of the truck drinking a beer and going home with those records we set. God bless America! dale Wooldridge says: September 20 2016 12:29 me and my dad ted and my good brother roger saw the barn job make a pass at lions drag strip in 1968 he did a 149 mph on gas a lot of the dragster didn’t go that fast !